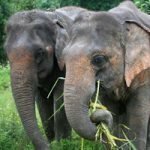 Join one of our ethical elephant tours as part of a small group for an unforgettable, intimate adventure observing elephants living in sanctuary throughout Thailand as well as in Cambodia. 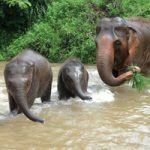 Watch elephants socialize, play, and forage amid beautiful natural surroundings – freed from elephant riding, performing tricks, and other unnatural behavior. 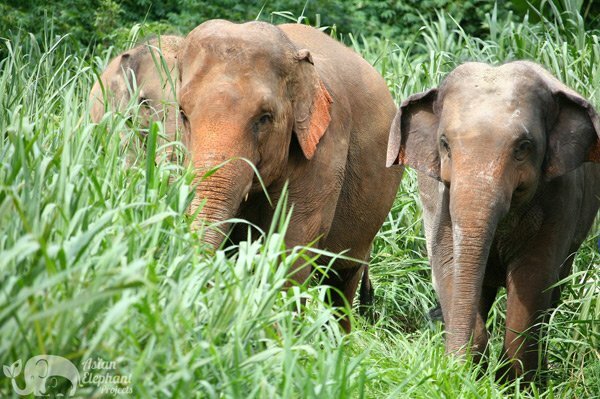 More than 25 independent projects are now providing a better life for these gentle giants. 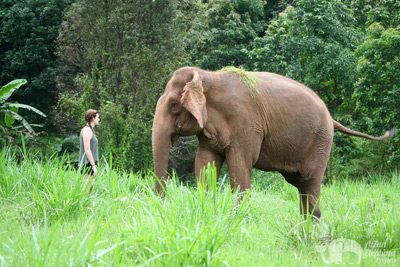 We offer a variety of elephant tours suitable for all ages and fitness levels, from challenging mountain jungle hikes with the elephants and whitewater rafting to scenic forest walks at a relaxed pace, watching the elephants forage along the way. The geographical locations of the various projects include mountains, jungles, and plains, which transform throughout the seasons. 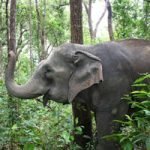 Most tours have between 3 to 7 elephants and limit guests to 3 or 4 people per elephant. All of our projects share a commitment to the well-being of the elephants and provide visitors with a safe and rewarding experience. Available projects include full and half day tours as well as one week volunteering. Our trips include local transportation, meals, qualified tour guides, and rafting where available. 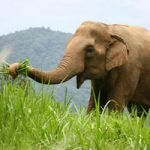 By visiting one of our elephant sanctuaries you are helping to reshape expectations of what visitors to Southeast Asia consider desirable when it comes to elephant tourism. 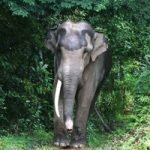 Your choice confirms that there are many people who want to observe elephants doing what comes naturally, without fear of punishment. Elephants are intelligent, social, empathic beings deserving of our respect, care, and admiration. 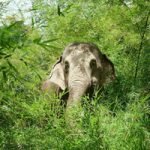 Already, more than 80 elephants are enjoying a healthier, happier, more natural life, thanks to responsible, eco-conscious travelers choosing Asian Elephant Projects. Check Availability and View Projects to find the right adventure for you. 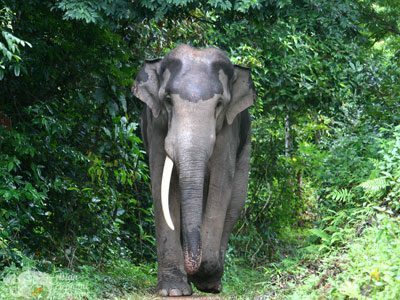 Walk with elephants along scenic jungle trails, forests, and mountains at a relaxed pace, stopping while they forage on native plants. 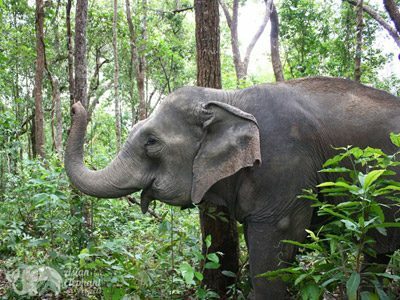 Observing elephants in their natural habitat is a fascinating experience – seeing how at home they are navigating the jungle slopes while carefully selecting plants to eat and using their remarkably strong and dexterous trunks to uproot tubers and clean off the dirt, snap branches, and communicate with each other. Asian Elephants can easily eat more than 300 kilograms of food a day. A healthy diet includes grasses, shrubs, bamboo, jungle leaves, tree bark, sugarcane, pumpkin, and of course bananas. 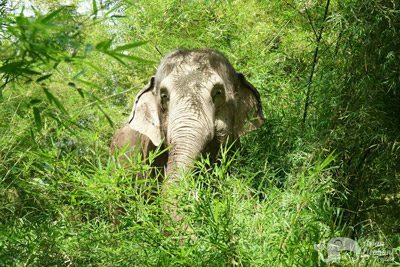 A good way to get acquainted with the elephants is to offer them fruit and vegetables as well as health balls containing medicinal herbs. It’s quite a thrill to have an elephant pluck food from your hand with their trunk. 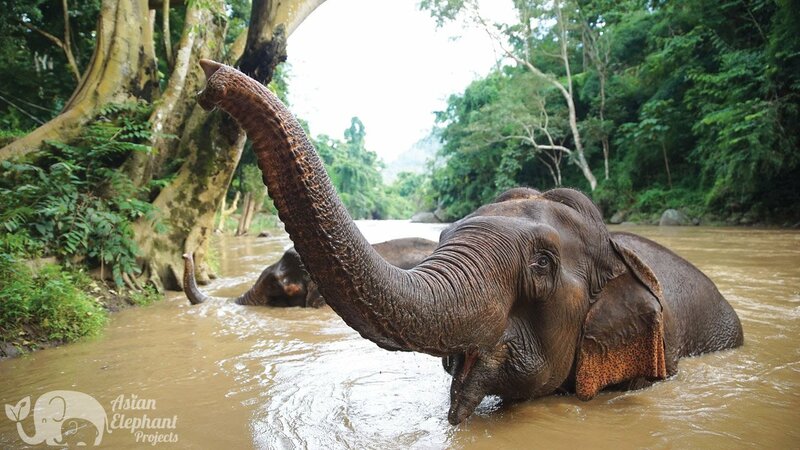 Elephants are very much at home in the water and are excellent swimmers. Surprisingly, their large bodies float easily and they love to relax together in rivers, streams, and pools. Watch the elephants dunk each other, use their trunks as snorkels while submerged, and create fountains. Young elephants love to play in the water and often clamber onto the back of another elephant and then slide back into the river. Mud baths are one of the all-time favorite activities of elephants. 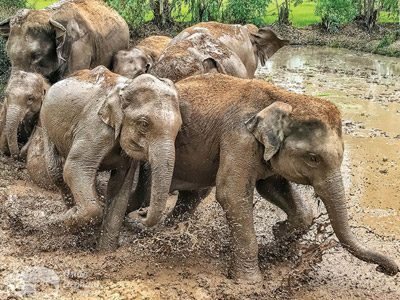 They love to roll around in the mud giving themselves and each other a full body mask as it cools and nourishes their skin, protecting it from insects and the sun. 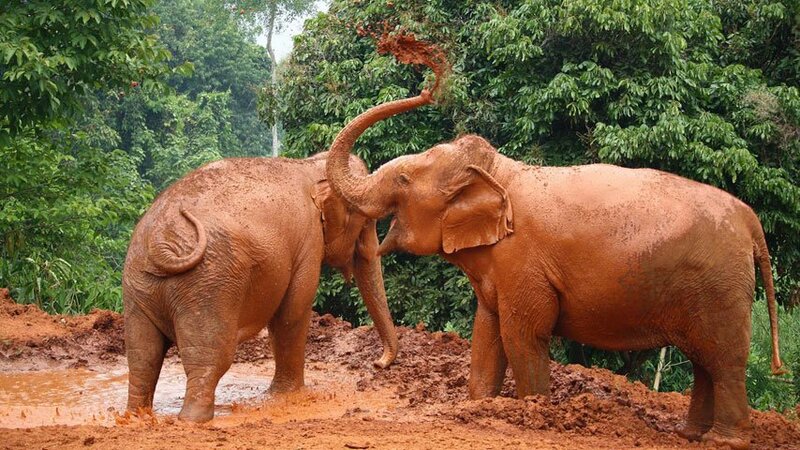 Their antics in the mud pools makes for some great photo opportunities as they fling mud high into the air in giant swirls with their trunks. 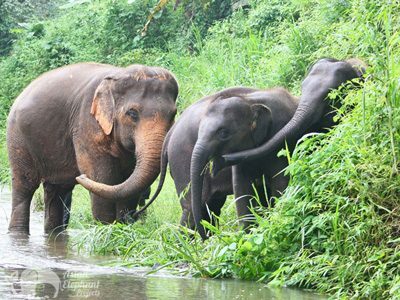 Join this half day tour for an unforgettable experience with a small herd of elephants, including a mother and her young, living happily together in the picturesque mountains of Northern Thailand. Observe the elephants socializing, foraging, and bathing in a cascading stream shaded by the jungle canopy. 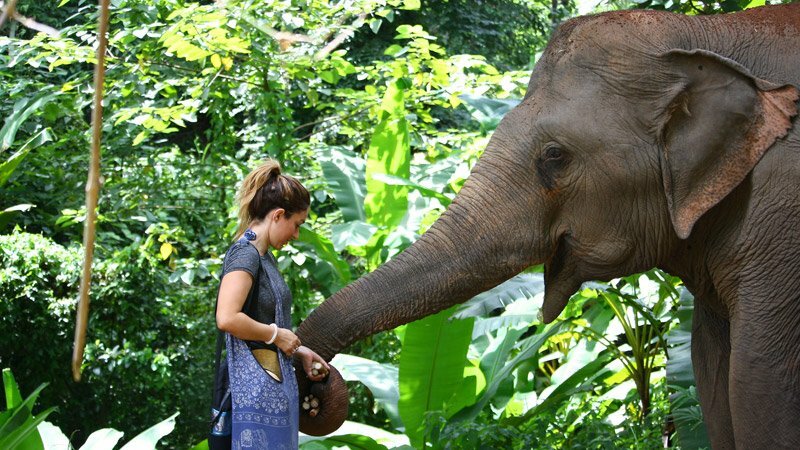 Feed the elephants, walk with them in the forest, and visit to a spectacular waterfall. As part of a small group of guests, enjoy a close encounter with a herd of elephants living in a beautiful natural sanctuary. 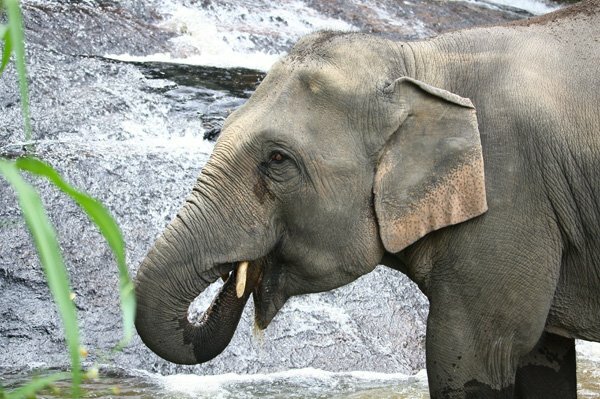 Activities are suitable for all ages and include taking a leisurely walk with the elephants, watching them playing in the mud and bathing them in the river. Located near Chiang Mai, this project is surrounded by forest and farmland with a stunning stream coursing through it. Karen Elephant Oasis is home to two beautiful female elephants - Mae Bubae and Mae Por - now relishing their new life where they are free to roam, play, and forage in the jungle. Guests will enjoy a meaningful experience in spectacular natural surroundings as they walk with the elephants under a jungle canopy leading to a beautiful cascading stream. This project can accommodate a maximum of 6 guests and so would be ideal for families or a group of friends who would like a private tour.